Our flood and water clean-up services provide extraction of flood or standing water and the deep cleaning and sanitising of water affected areas to both commercial and domestic properties. 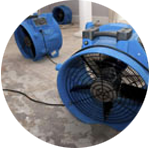 We offer a 24/7 rapid response flood and water clean-up service. All our staff are fully trained and use the latest equipment and methods. Contact us today to find out how we can help with your water clean-up requirements.